Just before we went off and stuffed ourselves with stuffing over Thanksgiving break, it seems the University of California buckled under the pressure from minority Asian groups to flesh out ethnic categorization on the UC application. But while proponents couch ethnic categorization on the merit-based application as “useful information,” the UC’s attempt to close a can of worms appears to have opened another. Officials and proponents argue the additional check boxes address the low representation of subgroups within the “other Asian” and “other other Asian” categories. We wonder, though, whether small percentages of groups whose percentages in the world are also small qualifies as underrepresentation. Perhaps the move is designed to correct the perennial iniquity wrought by the ability of “white” students to choose from an unparalleled 50 different associations on the application. Count Me In, the advocacy campaign for the issue, no doubt sees this as a success, but we wonder why the campaign deliberately chooses to Count Other Ethnic Minorities Out. If subgroup underrepresentation is a problem, shouldn’t the myriad students from regions currently identified as “Latinos” or “African-Americans” feel similarly about being lumped together? One might expect that a higher education system touting diversity would take every opportunity to represent the infinitude of possible ethnographic origins of its applicants, yet UC’s latest move largely ignores vast regions of the world. Boxing up ethnic groups on applications under auspices of being interested in the information without offending someone is impossible. A list responding to whoever cries “underrepresented!” loudest will still ignore groups who will likely complain later. An exhaustive list of possible ethnicities would waste time, money and moral fiber. Perhaps both scenarios could be avoided by providing each applicant a world map and a diversity-flavored thumb tack. 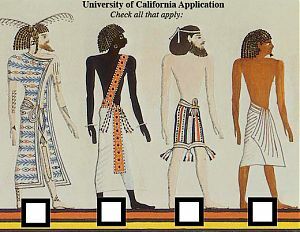 So which ethnographic statistics should the University of California reflect: the population of the world, the population of California or equal percentages across all ethnicities also mandating everyone to hold hands under rainbows and smile brightly at all times?